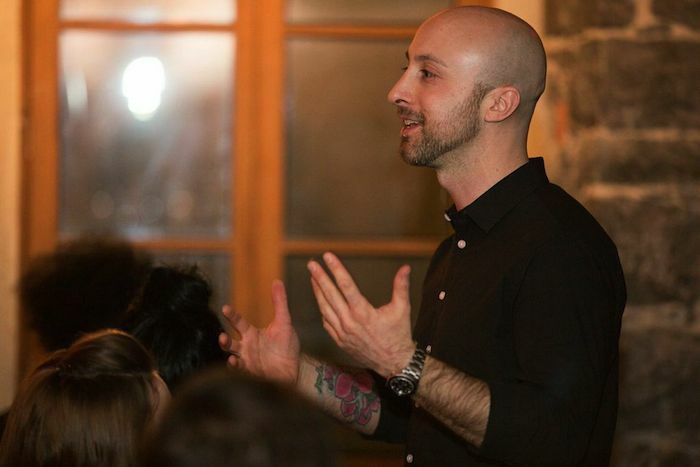 Late in 2014, Mimi la nuit, the latest project from Edward Zaki and Jeff Stinco (pictured below), opened on St. Paul in the space once occupied by Le Piano Rouge (the space goes all the way back to 1893 when it was known as the Catholic Sailors Club, a haven for sailors stopping over in Montreal). I often walked by Piano Rouge but only first entered the space last December when my curiosity about Mimi got the better of me. The snow had been piling up all day long but that didn’t stop us from escaping the trappings of a comfortable couch and radiant heaters and heading out into knee-deep snow. 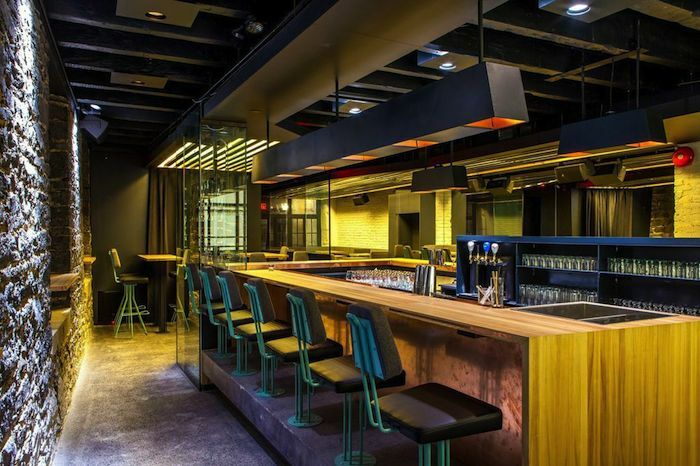 There are only so many nights a restaurant and bar lover can hold up at home and Mimi was the perfect place for an escape from encroaching cabin fever. The renovations undertaken to transform the space into Mimi are astounding. A complete floor to ceiling revamp of the original bar (I peeked in the window when it was Piano Rouge and the difference is remarkable) plus an extension at the back and an upstairs room that can be rented for larger private gatherings (group menus are offered), turned the once cavernous bar into a entirely modern yet completely comfortable space. Designed by La Firme (Quai No. 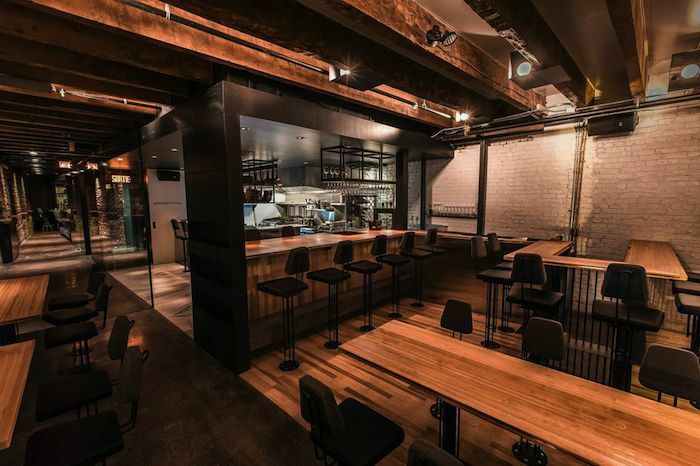 4, Huis Clos, Manitoba), Mimi la nuit features an open kitchen in the back of the bar where onlookers feel part of the action. A banquet lines the walls of the front of the bar with tables dotted along the walls as well. That December night, we chose a spot in front of the window and proceeded to have a drink and a bite from their concise menu. We could help but gush over the beauty of the space and knew that we’d have to make a return trip. Last week, I returned to Mimi la nuit as part of a media and blogger tasting event. Coinciding with the grand opening, we were whisked away upstairs after a few drinks around the bar to get a taste of what they serve on a nightly basis. Through the course of the night we were offered samples of various dishes from the entire menu and here’s a taste of what we tried. My favourite dishes of the night varied and here’s a few of them in no particular order. I loved the crunchy fried shrimp with lime and pepper mayo (fantastically presented as well). These are entirely addictive, served piping hot and the flavoured mayo adds a wonderfully salty zing. 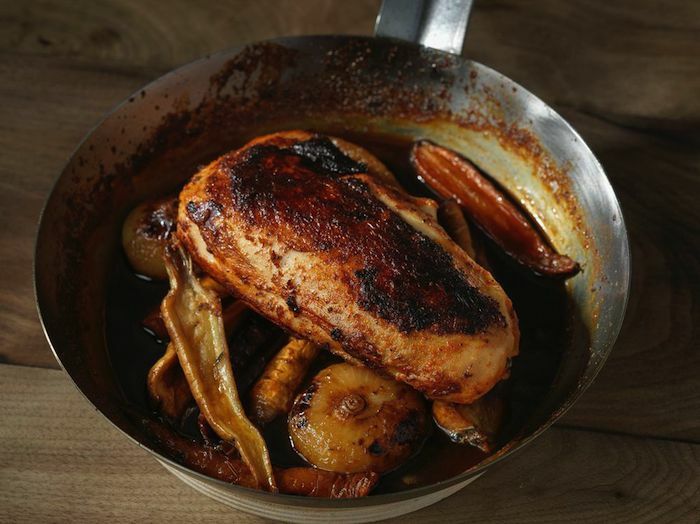 The deliciously juicy blackened chicken (pictured above) with root vegetables and jus au foin is another standout dish. Big enough to be shared, the chicken breast is full of flavour from the crisp skin through to the perfectly cooked meat. 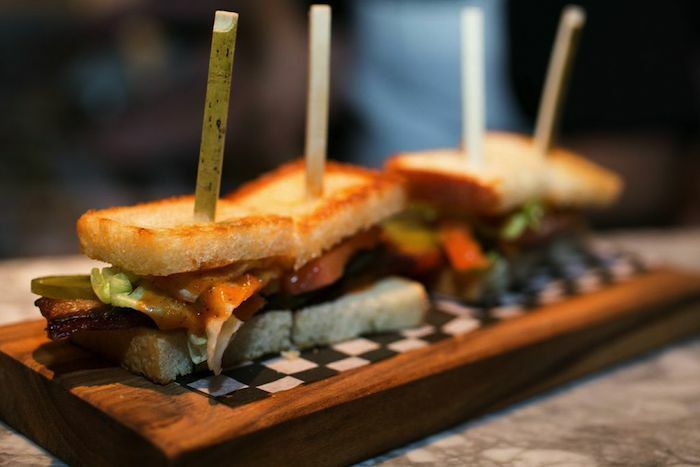 I also really enjoyed the taste-bud tingling, spiced melon salad with tomatoes an ricotta and the savoury sandwiches (pictured above) with pork flank, ketchup, pickles, tomato and iceberg lettuce. For dessert I the homemade salted caramel chocolate bar was a big hit and I only wish I was better at stealing chocolate off other people’s plates. I should add that I love the way most dishes are served at Mimi. 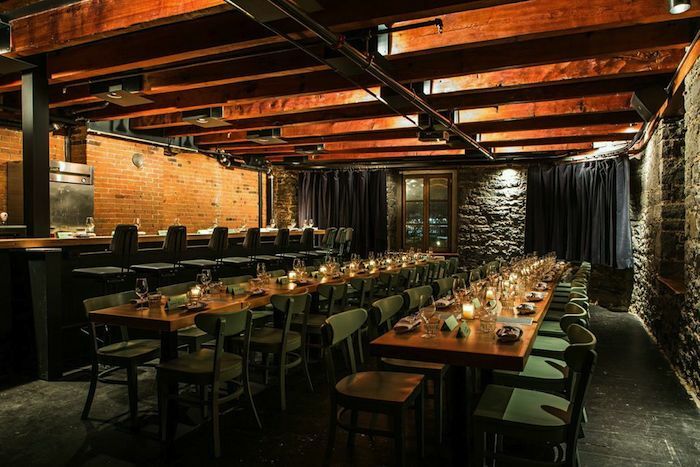 The wooden planks, rustic plates and bowls are a nice touch and add a nice contrast to the sharp design of the space. The lamb tortillas with mint and coleslaw were my least favorite item on the menu. Though the meat was well cooked and came off the bone in neat slivers with a fork, I found the tortillas were dry, hard and chalky to taste. The coleslaw could also have been a touch tangier. The other main issue I had was with the cheesecake served towards the end of the meal. 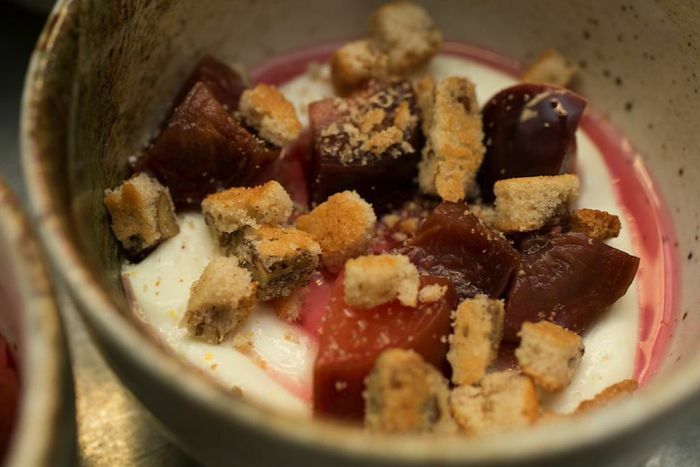 The deconstructed dessert came in a bowl with a blob of white cheesecake (pictured above) at the bottom and topped with macerated plums, cake crumble and pecans. The tasted like a cheesecake but it also floated on the plum juice. I’m all for trying new and creative ways to serve food but I think it would be great if this dish was served more traditionally. 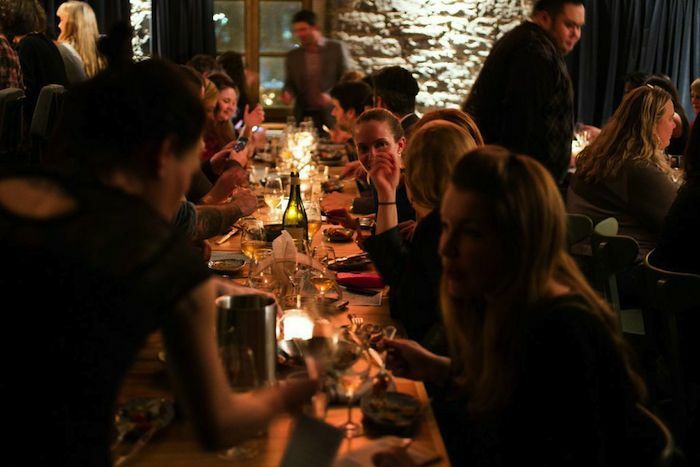 Mimi la nuit is a welcomed addition to Old Montreal’s great nightlife scene. The kitchen will be open until 2am from Wednesday to Sunday (opening hours are 5pm to 3am, lunch Monday to Friday starting Feb. 16) and each of the menu items run between $5 and $20 for individual, tapas style servings. The tortillas are the most expensive item on the menu at $28 but are meant to share. Mimi’s formula is a fantastic way for a group of friends to grab a few items off the menu and share them as a meal while enjoying a great cocktail, a beer or a glass of wine. The atmosphere is inviting, the space is modern and spacious. I absolutely love the redesign and I’m so excited to have a new space in the neighbourhood that fits the young professional to a tee. For more information, go visit their website. Or you can skip the website and just go for a visit as soon as possible and see it for yourself. It’s one of my favorite new nightlife hotspots in the city.